In the Fall of 2010, the owner of Belly Sprout, Christy Funk, posed a question on her Facebook wall. She asked us mamas out there if our dreams were on hold now that we have children or were we living the dream, balancing work that we loved and our children. This got me thinking. I had put my dreams on hold for awhile and I stopped to think about how I could adapt it to include my children. I let the ideas rattle around in my brain for the night on how to balance children and a music career and this is what I came up with. Why couldn’t I teach a mommy and me music class where my children were present and could enjoy it? No babysitter required. Now, I just had to pitch the idea to the store owner as I clearly had no venue to hold this class. I thought about doing a trial run with the GenX moms playgroup, but I was faced with the limitations of my small living room. I was nervous about broaching the idea to Christy out of fear of rejection, but I decided to “man up” and just go for it. My mantra was nothing ventured, nothing gained. I wrote her an email and pitched the idea and do you know what? She went for it. Do-Re-Me & Mommy was born. Since the holidays were approaching, we decided to host some free classes to introduce it to the community. 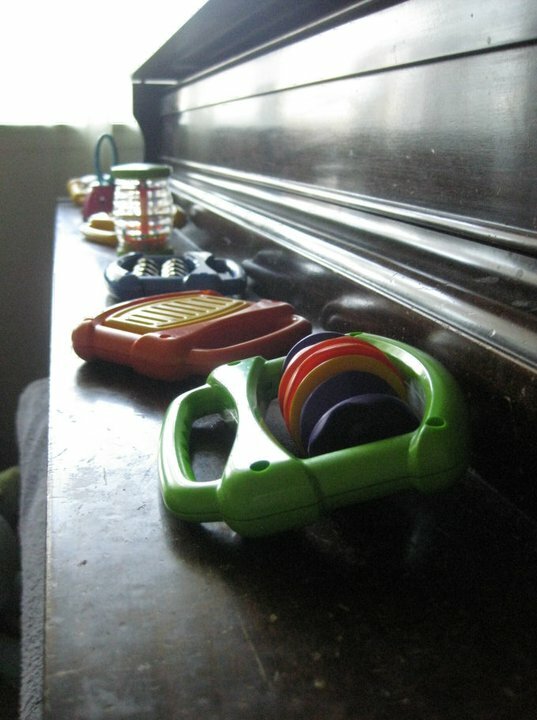 I gathered up some baby-safe musical instruments and cracked open the songbooks. I poured over hundreds of songs to find age-appropriate and popular tunes that most people would know. I found holiday songs set to popular children’s tunes and created song sheets, so parents could follow along. My goal was to make this fun and interactive. The day of the first class arrived and my nerves were through the roof; I don’t remember eating breakfast. I don’t even think I slept through the night. I woke up early and while all my boys were still snoozing, I headed around the corner to print the colored song sheets at the office supply store. Since it was close to Thanksgiving, I went with harvest gold. I had rehearsed the songs over and over and was getting worried Scooby wouldn’t be interested since he’d heard them a bunch of times, including on the car ride over to Belly Sprout. It was an overcast misty day, and I was hoping for a good handful of mamas and babes, but I tried to keep my expectations low. All the instruments were displayed on the kids’ table and I set up my IPod and speakers for the end of class boogie. What a joy it was to see friends and new faces coming to class. Eighteen moms showed up with their children in tow. We sang, we laughed, we jingled, we jangled. At the end, we all hung out and had a great time swapping mamahood stories while the kids danced and played. I felt so blessed to have such lovely mamas there who were encouraging even when I got nervous (Thanks Scriv!). It was an experience that still brings tears to my eyes. The warmth and camaraderie, the new friendships forged, all from a little spark that took courage to share and bring to fruition. I look forward to the future and I’m optimistic about keeping my dream alive in uncertain times.